As versatile as it is beautiful, our Leo Topper is designed to have you looking flawlessly chic - pronto! Fashioned in a perfectly gorgeous leopard print, it is exquisitely crafted in India with an open front, raw hem, and minimal side seams for fabulous flowy drape. 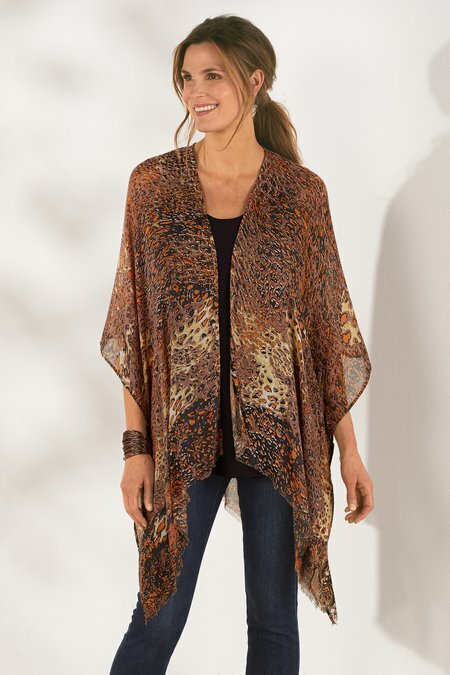 Pair it with a sheath, leggings, jeans, or a million other things for a great layer of warmth and enviable style. 29" long at center back.